RepliCel Life Sciences Inc., a biotechnology company based in Irvine, California, has reported the administration of the final injection in its phase 1 safety trial of their proprietary product RCT-01 in the treatment of patients with chronic Achilles tendinopathy. RepliCel’s RCT-01 consists of cells taken from a patient’s own hair follicles. These “non-bulbar dermal sheath” or NBDS cell are isolated from the hair follicle sheath and expanded in culture. In this clinical trial, the NBDS cells are used to treat patients with chronic tendinosis, a condition caused by acute and chronic tendon overuse. RepliCel has received Health Canada Clearance and UBC Ethics approval to conduct its Phase 1/2 clinical trial for the treatment of chronic Achilles tendinosis. The RCT-01 chronic Achilles tendinosis clinical research study will take place at the University of British Columbia in Vancouver, BC. RepliCel’s Phase 1/2 trial will enroll 28 subjects, all of whom suffer from chronic tendinosis and have failed traditional tendon treatments, but are, otherwise, in good health. NBDS cells will be isolated from a small punch biopsy taken from the back of the scalp, expanded in culture and then reintroduced into the wounded tendons under the guidance of ultrasound. After these injections, all subjects will return to the clinic for assessments of safety, function and pain, as well as changes in tendon thickness, echotexture, interstitial tears and neovascularity. Since the last patient has been injected with their own NBDS cells, the last scheduled patient visit to collect treatment follow-up data will be in late November. All data from this trial will be assessed for clinical safety of NBDS cells and six-month efficacy. These data should be un-blinded and made available for analysis and dissemination near the end of this year. year-end. This trial is designed to ascertain the signs of efficacy but it is simply not statistically powerful enough to draw any strong conclusions about efficacy. “What we are looking for is a convincing signal, in at least some of the treated patients, that the product has clinically relevant outcomes in terms of restoration of function, reduction of pain, and/or regeneration of the tendon structure as measured by ultrasound imaging,” said RepliCel’s Rolf Hoffmann. Data from this trial, will, however, inform and guide RepliCel’s product development and clinical trial strategy not only for Achilles tendinopathy but also for several other tendon repair applications including the treatment of jumper’s knee, golfer’s elbow, tennis elbow, and rotator cuff. RCT-01 contains, largely, type 1 collagen-expressing fibroblasts derived from the hair follicle. These NBDS fibroblasts have the potential to address many clinical conditions that result from a deficiency of active fibroblast cells, which are required for tissue remodeling and repair. NBDS fibroblast cells, isolated from healthy hair follicles, are a rich source of fibroblasts unique in their high-level expression of the necessary proteins, such as Type I collagen, which can jump-start the stalled healing cycle. RepliCel is in the process of developing a series of products from this platform that have the potential to address large commercial markets in the areas of musculoskeletal and skin-related conditions. In the July 2016 edition of the journal Stem Cells Translational Medicine, a report has been published that lays out the results of a phase I clinical trial that used mesenchymal stem cells from a patient’s own fat tissues to treat osteoarthritis of the knee. This study was not placebo controlled, but did examine the effects of escalated doses on the patient. The main investigator for this trial was Dr. Christian Jorgensen from Lapeyronie University Hospital in Montpellier, France. Osteoarthritis (OA) is the most common musculoskeletal condition in adults and it can cause a good deal of pain and disability. Joints like the knee consist of a junction between two or more bones. The ends of these bones are capped by layer of cartilage called “hyaline cartilage” that serves as a shock absorber. 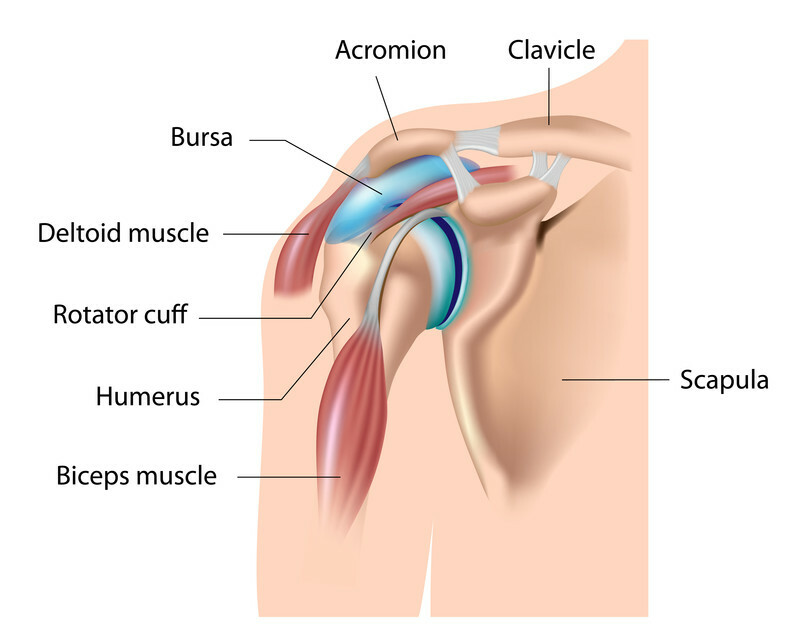 Larger joints like the knee, shoulder, and hip are encased in a sac called the “bursa” that is filled with lubricating synovial fluid. OA involves damage and/or destruction of the cartilage caps at the ends of long bones, and erosion and ultimately permanent changes in the structure of bone that underlies the cartilage at the end of the bone. The knee loses its shock absorbers and lubricators and becomes a grinding, inflamed, painful caricature of its former self. To treat OA, most orthopedic surgeons will replace the damaged knee with an artificial knee that is attached the upper (femur) and lower (tibia and fibula) bones of the leg. This procedure, arthroplasty, reconstructs the knee with artificial materials that form synthetic joints. Alternatively, some enterprising physicians have tried to use stem cells from bone marrow to repair eroded cartilage in the knees of OA patients. Christopher Centeno and his colleagues at his clinic near Denver, CO and affiliated sites have pioneered procedures for OA patients. However, Dr. Centeno remains skeptical of the ability of stem cells from fat to treat patients with OA. In animal studies, OA of the knee can be induced by injected tissue-destroying enzymes. If laboratory mice that received injectionof these enzymes into their knees are then treated with fat-based mesenchymal stem cells, the effects and symptoms of OA do not appear (ter Huurne M, et al. Arthritis Rheum 2012; 64:3604-3613). In another study in rabbits, injections of 2-6 million fat-derived mesenchymal stem cells into the knee-joint of rabbits suffering from OA improved cartilage health and inhibited cartilage degradation. These administered cells also reduced inflammation in the knee (Desando G., et al., Arthritis Res Ther 2013; 15:R22). Therefore, fat-based mesenchymal stem seem to have some ability to ameliorate the effects and consequences of OA, at least in preclinical studies. This trial is the beginnings of what will hopefully be a series of experiments that will assess the ability (or inability) to treat OA patients. 18 patients were enrolled from an initial pool of 48 candidates who all suffered from severe, symptomatic OA of the knee. Six patients received 2 million mesenchymal stem cells isolated from their own fat, 6 others received ten million mesenchymal stem cells isolated from their own fat, and the final group of 6 OA patients received 50 million mesenchymal stem cells isolated from their own fat tissues. These mesenchymal stem cells were isolated from the patient’s fat that was collected by means of liposuction. The fat was then processed by means of a standard protocol that is used to isolated mesenchymal stem cells from human fat (see Bura A, et al., Cytotherapy 2014; 16:245-257). All patients received their stem cells by means of injection into the knee-joint (inter-articular injections). Because this is a Phase I clinical trial, assessing the safety of the procedure is one of the main goals of this study. No adverse effects were associated with either the liposuction or the interarticular injections. The article even states: “Laboratory tests, vital signs and electrocardiograms indicated no local or systemic safety concerns.”. Four patients experienced slight knee pain and joint effusion that either resolved by itself or with treatment with a nonsteroidal antinflammatory drug (think ibuprofen). Therefore it seems fair to conclude that this procedure seems safe, but a larger, placebo-controlled study is still required to confirm this. As to the patient’s clinical outcomes, 17 of the 18 patients elected to forego total knee replacement. All patients showed improvement in pain and knee functionality at 1 week, 3 months and 6 months after the procedure. However, only the low-dose group showed improvements that were statistically significant. WOMAC pain and function improvement during the study. Abbreviation: WOMAC, Western Ontario and McMaster Universities Arthritis Index. Seven of the patients treated in Germany (11 patients were treated in France and 7 were treated in Germany) were also examined with Magnetic Resonance Imaging (MRI) before and 4 months after the procedure. Six of the seven patients showed what could be interpreted as improvements in cartilage. dGEMRIC and T1rho magnetic resonance imaging (MRI) of selected patients. The graphs on the left show the dGEMRIC (n = 6) and T1rho (n = 5) values before and 4 months after cell therapy. Increasing dGEmRIC and decreasing T1rho values are each known to correspond to increasing glycosaminoglycan/proteoglycan content and thus improved cartilage condition. On the right, the corresponding dGEMRIC and T1rho maps are shown as a color-coded overlay on an anatomical MRI for a patient receiving a low cell dose. The observed values in the cartilage change in the time course can be easily seen and correspond to an increase in cartilage condition. Abbreviation: dGEMRIC, delayed gadolinium-enhanced magnetic resonance imaging of cartilage. Tissue biopsies of 11 of the 18 patients revealed an absence of significant inflammation, but some patients (4-5) showed signs of weak or moderate inflammation. One patient showed what seemed to be a sheet of MSC cells on the surface of the cartilage. Histologic findings. (A): Vascular congestion and weak lymphocytic infiltrate of the synovial (case 8) (magnification, ×50). (B): Osteoarthritic cartilage OARSI grade >3 (case 4) (×25). (C): Toluidine blue staining (case 2) (magnification, ×100). (D): Stem cell stroma shows an Alcian blue depleted matrix compared with the strong staining of osteoarthritic cartilage (case 2) (magnification, ×100). (E): Weak PS100 staining of possible stem cells on the cartilage surface and strong PS100 staining of chondrocytes (case 2) (magnification, ×100). Abbreviations: OARSI, Osteoarthritis Research Society International. The primary outcome of this study – the safety of interarticular injections of fat0-based mesenchymal stem cells – seems to have been satisfied. This is similar to the safety profiles of such cells in clinical trials that have used fat-based mesenchymal stem cells to treat fistulae in inflammatory bowel disease (Bura A, et al., Cytotherapy 2014; 16: 245-257) or critical limb ischemia (Lee WY and others, Stem Cells 2013; 31:2575-2581). Also, patients showed improvements in pain and functionality. Even though there was no placebo in this study, a double-blinded, placebo-controlled study that examined the use of efficacy of interarticular hyaluronic acid injections showed a smaller decreased in pain score that what was observed in this case (22.9 ± 1.4 vs 30.7 ± 10.7). It is doubtful that the injected mesenchymal stem cells made much cartilage but instead quelled inflammation and stimulated resident stem cell populations to repair damage in the knee. This study is small and is not placebo controlled, however, the hopeful results do warrant a larger, phase 1/2 placebo-controlled study that is apparently already underway. An even more intriguing project might be to prime the isolated mesenchymal stem cells to make cartilage and then use live fluoroscopy to overlay the cells on the actual cartilage lesions. While this is a more exacting procedure, it is the way Centeno and his group are using stem cells to treat their patients, and a true head-to-head study of the efficacy of fat-based mesenchymal stem cells versus bone marrow-based mesenchymal stem cells would be immensely useful. RepliCel Life Sciences has enrolled subjects for their skin rejuvenation and tendon repair trial. The primary goal of these trials is to determine the safety of their cell therapeutic products. In the first trial will test a product called RCS-01, which consists of cells derived from non-bulbar dermal sheath (NBDS) cells, which are taken from the outer regions of hair follicles. NBDS cells express type 1 collagen, a protein that is steadily degraded in aged skin (hence the formation of wrinkles). Therefore, RepliCel is confident that RCS-01 injections underneath the skin has the potential to rejuvenate aged or damaged skin. The trial will examine male and female subjects, between 50-65 years old, and will address the inherent deficit of active fibroblasts required for the production of type 1 collagen, elastin and other critical extracellular dermal matrix components found in youthful skin. The trial will be conducted at the IUF Leibniz-Institut für umweltmedizinische Forschung GmbH in Dusseldorf, Germany. Originally, RepliCel wished to enrolled 15 men and 15 women, but the large number of female subjects and paucity of men persuaded the company to move forward with the trial despite only enrolling a few men and all the projected women. The second trial will test the safety and efficacy of RCT-01 in the repair of damaged Achilles tendons. RCT-01 also consists of NBDS cells and this trial is a phase 1/2 clinical trial that examines the ability of NBDS cells to treat chronic tendinosis caused by acute and chronic tensile overuse. This trial will take place at the University of British Columbia in Vancouver, BC, and will only treat 10 subjects. Even though RepliCell wishes to originally test 28 participants, the company shorted the trial in order to have safety data by the end of 2016. Darrell Panich, RepliCel Vice President of Clinical Affairs, said that the company had a late start on its trials, and therefore truncated the recruitment process in order to have safety data for analysis by the end of 2016. Despite the small size of these trials (and they are small), the company is hopeful that their safety data will provide the impetus for moving forward with larger phase 2 trials. “The delivery of clinical data when promised is important to management”, said R. Lee Buckler, President & CEO, RepliCel Life Sciences Inc. “We have made critical decisions to keep our commitment to the financial community and we believe the data from these trials will facilitate us closing a licensing and co-development deal on one or both of these products similar to the kind we have in place with Shiseido Company for our RCH-01 product,” he added. RepliCel is confident that their NBDS fibroblast platform will address numerous indications where impaired tissue healing has been stalled due to a paucity of active fibroblasts, which are required for tissue remodeling and repair. NBDS fibroblasts, isolated from the hair follicles of healthy individuals, are a rich source of fibroblasts and are unique in their ability to express high levels of type 1 collagen and elastin to push-start the healing process. RepliCel is also developing products from this same platform to address larger commercial markets in the areas of musculoskeletal and skin-related conditions. Loïc Reppel and his colleagues at CNRS-Université de Lorraine in France have found that mesenchymal stem cells from human umbilical cord can not only be induced to make cartilage, but that these remarkable cells can make cartilage without the use of exogenous growth factors. Mesenchymal stromal/stem cells from bone marrow (BM-MSC) have, for some time, been the “all stars” for cartilage regeneration. In fact, a very innovative clinic near Denver, CO has pioneered the use of BM-MSCs for patients with cartilage injuries. 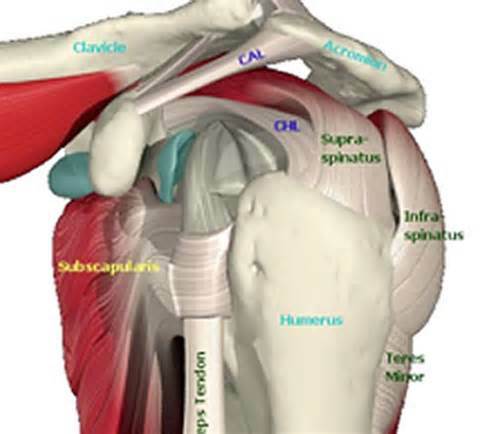 Chris Centeno, the mover and shaker, of this clinic has carefully documented the restoration of articular cartilage in many patients in peer-reviewed articles. However, there is another “kid’ on the cartilage-regeneration block; mesenchymal stromal/stem cells from Wharton’s jelly (WJ-MSC). The advantages of these cells are their low immunogenicity and large cartilage-making potential. In this paper, which was published in Stem Cell Research and Therapy, Reppel and others evaluated the ability of WJ-MSCs to make cartilage in three-dimensional culture systems. 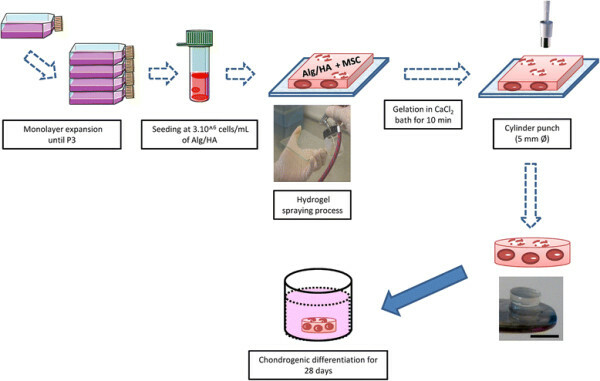 Reppell and his coworkers embedded WJ-MSCs isolated from the umbilical cords of new-born babies in alginate/hyaluronic acid hydrogel and grew them for over 28 days. These hydrogels were constructed by the spraying method. The hydrogel solution (for those who are interested, it was 1.5 % (m/v) alginate and hyaluronic acid (ratio 4:1) dissolved in 0.9 % NaCl) was sprayed an airbrush connected to a compressor. The solution was seeded with WJ-MSCs and then sprayed on a sterile glass plate. 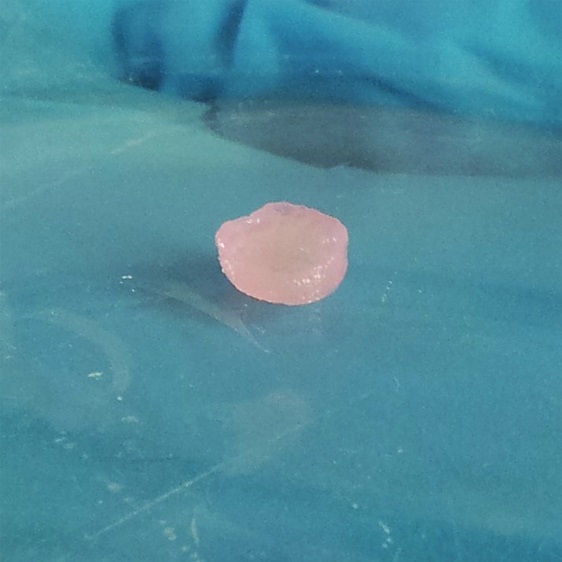 The hydrogel was made solid (gelation) in a CaCl 2 bath (102 mM for 10 minutes). Then small cylinders were cut (5 mm diameter and 2 mm thickness) with a biopsy punch. Then Reppel and others compared the chondrogenic differentiation of WJ-MSC in these three-dimensional scaffolds, without adding growth factors with BM-MSC. After 3 days in culture, WJ-MSCs seemed nicely adapted to their new three-dimensional culture system without any detectable damage. From day 14 – 28, the proportion of WJ-MSC cells that expressed all kinds of cell surface proteins characteristic of MSCs (i.e., CD73, CD90, CD105, and CD166) decreased significantly. This suggests that these cells were differentiating into some other cell type. After 28 days in this scaffold culture, both WJ-MSCs and BM-MSCs showed strong upregulation of cartilage-specific genes. However, WJ-MSCs exhibited greater type II collagen synthesis than BM-MSCs, and these differences were evident at the RNA and protein levels. Collagen II is a very important molecule when it comes to cartilage synthesis because chondrogenesis, otherwise known as cartilage production, occurs when MSCs differentiate into cartilage-making cells known as chondroblasts that begins secreting aggrecan and collagen type II that form the extracellular matrix that forms cartilage. Unfortunately, in order to complete the run to mature cartilage formation, the chrondrocytes must enlarge (hypertrophy), and express the transcription factor Runx2 and secrete collagen X. Unfortunately, WJ-MSCs expressed Runx2 and type X collagen at lower levels than BM-MSCs in this culture system. These experiments only examined cells in culture, which is not the same as placing cells in a living animal, but it is a start. Thus, when they are seeded in the hydrogel scaffold, WJ-MSCs and BM-MSCs, after 4 weeks, were able to adapt to their environment and express specific cartilage-related genes and matrix proteins in the absence of growth factors. In order to properly make cartilage in clinical applications, WJ-MSCs must go the full way and express high levels of Runx2 and collagen X. However, these experiments show that WJ-MSCs, which in the past were medical waste, are a potential alternative source of stem cells for cartilage tissue engineering. Reppel and his colleagues note in their paper that to improve cartilage production from WJ-MSCs, it might be important to mimic the physiological environment in which chondrocytes normally find themselves. For example, they could apply mechanical stress or even a low-oxygen culture system. Additionally, Reppel and others could apply stratified cartilage tissue engineering. Reppel thinks that they could adapt their spraying method to design new stratified engineered tissues by applying progressive cells and spraying hydrogel layers one at a time. All in all, cartilage repair based with WJ-MSC embedded in Alginate/Hyaluronic Acid hydrogel will hopefully be tested in laboratory animals and then, perhaps, if all goes well, in clinical trials. Work by Chul-Won Ha, director of the Stem Cell and Regenerative Medicine Institute at Samsung Medical Center and his colleagues illustrates the how stem cell treatments might help regrow cartilage in patients with osteoarthritis or have suffered from severe hip or knee injuries. A 2011 report from the American Academy of Orthopedic Surgeons showed that approximately one million patients in the US alone (645,000 hips and 300,000 knees) have had joint replacements in the U.S. alone. Most joint replacements occur with few complications, artificial joints can only last for a certain period of time and some will even eventually require replacement. Also these procedures require extensive rehabilitation and are, in general, quite painful. A goal for regenerative medicine is the regenerate the cartilage that was worn away to prevent bones from eroding each other and obviate the need for artificial joint replacement procedures. Extensive research from the past two decades from a whole host of laboratories in the United States, Europe, and Japan have shown that mesenchymal stem cells (MSCs) have the ability to make cartilage, and might even have the capability to regenerate cartilage in the joint of a living organism. MSCs have the added benefit of suppressing inflammation, which is a major contributor to the pathology of osteoporosis. Additionally, MSCs are also relatively easy to isolate from tissues and store. “Over the past several years, we have been investigating the regeneration potential of human umbilical cord blood- derived MSCs in a hyaluronic acid (HA) hydrogel composite. This has shown remarkable results for cartilage regeneration in rat and rabbit models. In this latest study we wanted to evaluate how this same cell/HA mixture would perform in larger animals,” said Ha. Ha collaborated with researchers from Ajou University, which is also in Seoul, and Jeju University in Jeju, Korea. Ha and his team used pigs as their model system, which is a better system than rodents for such research. The stem cells for this project were isolated from human umbilical cord blood that was obtained from a cord blood bank. They isolated MSCs from the umbilical cord blood and grew them in culture to establish three different human Umbilical Cord Blood MSC lines. Then they pelleted the cells and mixed them with the HA solution and applied them to the damaged knee joints of pigs. “After 12 weeks, there was no evidence of abnormal findings suggesting rejection or infection in any of the six treated pigs. The surface of the defect site in the transplanted knees was relatively smooth and had similar coloration and microscopic findings as the surrounding normal cartilage, compared to the knees of a control group of animals that received no cells. The borderline of the defect was less distinct, too,” said the study’s lead investigator, Yong-Beom Park, who is a colleague of Ha’s at the SungKyunKwan University’s Stem Cell and Regenerative Medicine Institute. “This led us to conclude that the transplantation of hUCB-MSCs and 4 percent HA hydrogel shows superior cartilage regeneration, regardless of the species. These consistent results in animals may be a stepping stone to a human clinical trial in the future,” Dr. Ha noted.